Chuck Lorre regrets not quitting Two and a Half Men when Charlie Sheen attacked Brooke Mueller with a knife in 2009, he tells TV Guide. “That should have been it,” Lorre says. “I should have walked. That’s unthinkable,” he says, even though Sheen had been charged in a number of domestic violence disputes before 2009. 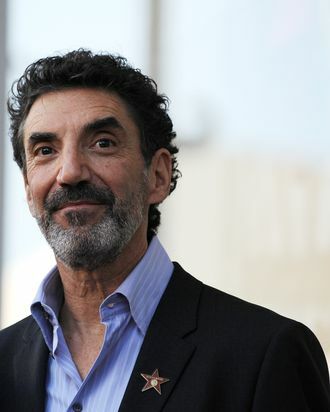 “But for some reason I thought that because she was willing to forgive him … we could emerge from this fiasco and be stronger and healthier.” It didn’t work like that, though, and Lorre says Sheen’s drug abuse eventually affected Men’s professional environment. “This was drug addiction writ large. This was big-time cocaine and in his own words, an ‘epic drug run’ that could have ended with either his death or someone else’s,” Lorre says. “You couldn’t do that much cocaine and work.” Please, someone, write a juicy and perfect roman à clef about this so we can all put the Lorre/Sheen/Kutcher/Winning nonsense to bed once and for all.